Heat the oil in a large, heavy based pan and add the chicken thighs. Cook on all sides over a high heat for 5 minutes until browned. Remove from the pan and set aside. Pour off all but a tablespoon of fat from the pan. Add the vegetable mix, garlic and ginger to the pan and cook over a medium heat for a further 3–5 minutes until softened and golden. Add the curry powder to the pan and stir over the heat for 1 minute. Stir in the canned tomatoes and return the chicken to the pan with 150ml water. Bring to the boil, half cover and simmer, stirring occasionally for 30 minutes until the chicken is cooked through and the sauce is thickened. Stir in the spinach, season and return to the heat. Simmer for 5 minutes until the spinach is cooked through. Scatter with chopped coriander and serve. skin before serving. 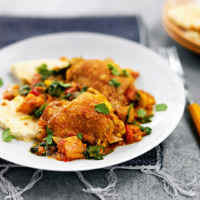 You could try the Kitchen Guru Chicken Jalfrezi Spices as an alternative to the medium curry powder.